Hardee's adds new honey butter to their Made from Scratch biscuits for a limited time at participating location. 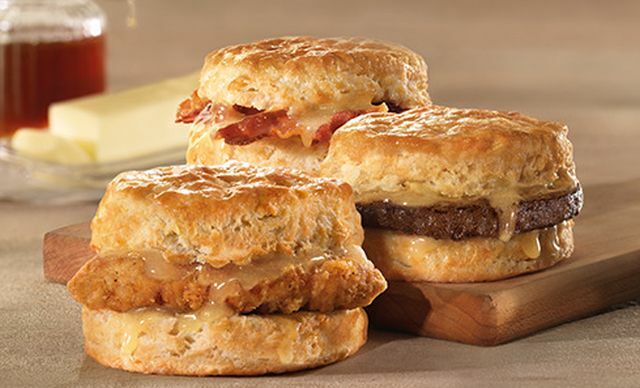 The new Honey Butter Biscuits feature a choice of either a crispy-fried chicken filet, a grilled sausage patty, or applewood-smoked bacon plus honey butter on a scratch-made biscuit. Prices range around $4 for the chicken biscuit and $2 or so for the sausage or bacon options. They also tested a Chick-fil-A-style chicken sandwich with pickles and honey butter but it looks like that didn't make the cut.